Anchor the discussion. Take a power position. Dig in your heels. Get the best deal possible by holding your ground. There’s a whole lot of negotiation advice and guidance swirling around, and it can be tough to figure out what gems you’re supposed to pick up…and which duds you need to leave behind. One of these duds is positional negotiating, because I’ve gotta say, walking into your negotiation with a single-focus and stubborn mindset may make you feel powerful…but it will do more harm than good. Sigh. This kind of scenario makes my stomach turn. 1 – it’s boring 2- it’s tacky 3-it’s amateur. Where’s the discussion of value? Where’s the collaboration? Where’s the relationship building? It hardly looks like a negotiation. After years of participating in negotiations, I can assure you that nothing sends the message of lack of true confidence and being an amateur like coming in with this approach. But is there really a better way? Yes – there is – and it takes some practice but yields far better results than being a positional negotiation robot. Whether it’s your style that needs the adjustment, or you’re having positional behaviour directed your way during a negotiation, here’s how to make the shift that will reap big rewards. Move your framing of the discussion from ‘negotiating against’ to ‘negotiating with’ in order to increase the collaborative nature of your discussions. Negotiations are not a battle, and you’re not out to ‘get’ or ‘beat’ your ‘opponent’. Trust me, it’s hard to be positional when your mindset is one of finding solutions that work for both of you. ‘Because I said so…’ has no place in a negotiation. Know why you need something, and communicate that. If you can support what you’re asking for, you’re moving away from a blind positional approach. Often, when we start a negotiation being positional, our basis for making an offer is simply to give us the most distance possible between the starting point and where we think the bargaining will land us. Being able to support even your most aggressive offers with rational justification will let your counterpart know that this isn’t a game. Purposely shift a conversation to non-quantitative topics in order to build the rapport and trust needed for collaboration. Achieve success with other negotiation topics, set a tone of using your values and rational justifications for achieving those agreements and then move back to the more difficult/positional topics. It will be hard for your counterpart to stand their positional ground once you’ve shared wins with a more elegant style of negotiation. 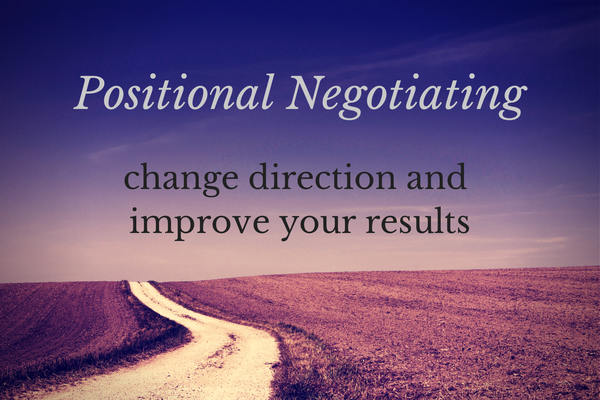 Have you ever been in a positional negotiation? How did it work out for you? Which technique above has worked for you? Let me know…what do you think of positional negotiations?